We finally had good weather for our Village of LeRoy storm drain marking. A crew of six folks spent the morning affixing the medallions to the drains. We also got to chat with curious residents. We will continue the program next spring. Keep you posted! Jim and Pete on South Street! Well folks the weather looks great for Saturday October 15 (finally) . I just had a few items to share before then. 1. We’ll be meeting at 9:00 AM in the parking lot behind the United Methodist Church, off Trigon Park in the Village of LeRoy. We will work until noon, or stop earlier if we have all medallions installed. 2. 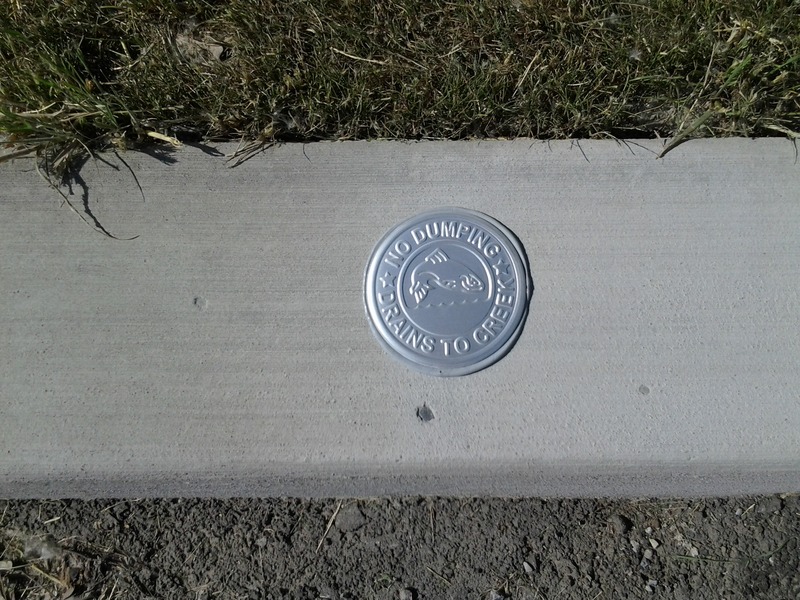 We have 200 medallions to install. Hopefully we will have enough volunteers to have 3 or 4 3-person teams. 3. Jennifer has separated the remaining Village areas into groups of streets (routes) with each group containing around 50 storm drains. With 4 teams that will mean each team will do 50 storm drains, which should be easily accomplished in 3 hours. 4. We do not have soft brushes to clean curbs after we use the steel brushes. If you have a regular broom please bring it. I will be bringing one. Each team should have one. 5. Supplies that I have include, construction adhesive, safety vests, steel brushes, caulking guns. 6. I think Lisa has the medallions, safety goggles, gloves, and maybe some other items. 7. Nikki could you bring the buckets? I can take them after event and store them. 8. I drove around one of the routes ( North Street and street to east of it Genesee and Lathrop). I noticed that these have grass over the top of the curb. We will need to remove this grass to place the medallion ( a trowel of other tools may be needed and we use extra buckets to collect the grass and soil removed and dispose of later, so we don’t make a mess. 9. I am going to try and get aerial photos for the different routes. 10. I have a couple of clip boards I’ll bring so that teams can write down any problems they observed, e.g. drains where no curb existed to install medallion, backed up drains with standing water, or drains needing repair. We can share this info with Village Public Works. If you have some clip board bring them. Let me know if there are any questions or suggestions. We didn’t get much rain, but it was enough to make things just wet enough to have to cancel again! The caulk needs a dry surface to work properly. Sorry about that. We’re rescheduling for next Saturday. We will still meet in the parking lot behind the United Methodist Church, off Trigon Park at 9:00 AM. Keep your fingers crossed that Mother Nature will smile favorably on us next weekend! 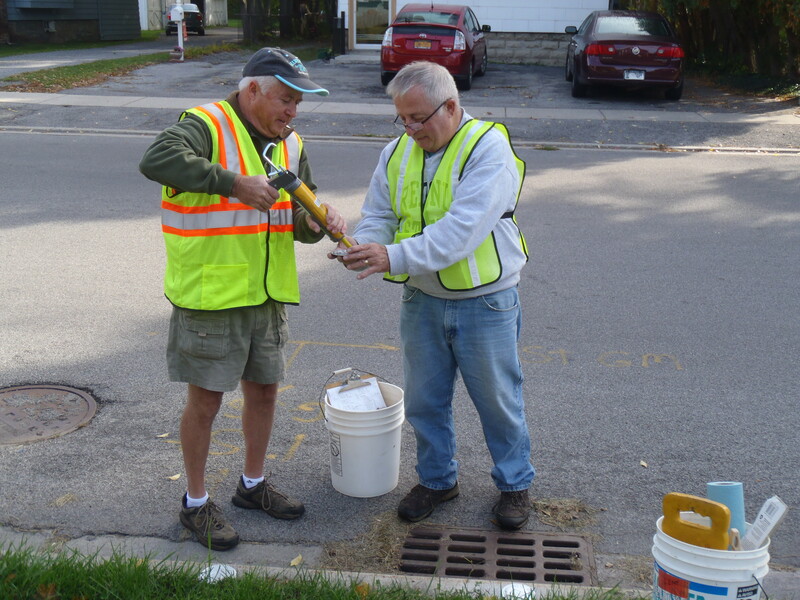 We’re going to try to give it another go on the Storm Drain Marking in the Village of LeRoy tomorrow, but the weather doesn’t look too promising. According to the NOAA, there’s a 50% chance of showers tonight, and 70% tomorrow. We will be posting updates here, and for fastest news, check in at our Facebook page. (see link on lower left sidebar). 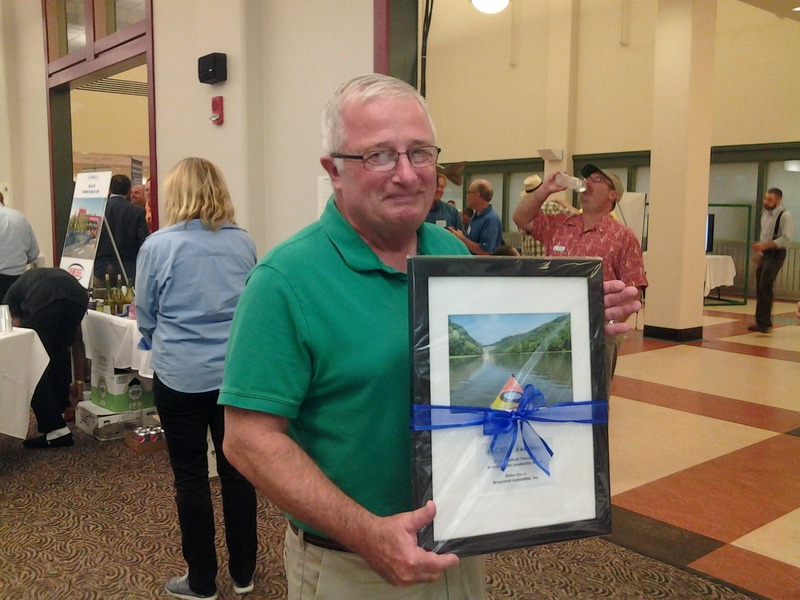 Last night, several OCWC members attended the Genesee River Watch ‘River Bash’. It was a lot of fun – there was good music, food, and information. We got to see many, many folks we have worked with. It was an honor for the OCWC to be recognized by the GRW for our work, we were one of three recipients of the Elizabeth Thorndike Environmental Award. Other recipients were the Seneca Park Zoo Society for their “One Cubic Foot” project & the Dueppengiesser Dariy Co. of Perry for their outstanding management practices and educational outreach. OCWC’s recent Trees for Tribs projects along the lower Oatka were especially noted. It was a very nice event, and we highly recommend going next year! It couldn’t have happened without Pete! Thanks for your hard work! 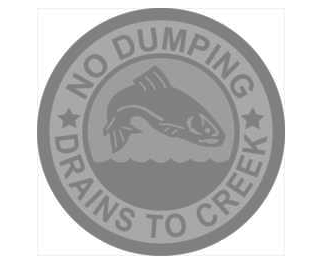 We’re delaying the Storm Drain marking project until next Saturday, October 8, as there is a 50% chance of rain today, with 60% tonight. We want to give the caulk a good chance to cure properly so all our good work won’t go to waste! See you next Saturday, bright (we hope!) and early at 9:00 AM in the parking lot behind the LeRoy United Methodist Church off Trigon Park. Let’s hope the weather is bright & sunny.